Here at the Law Office of Douglas R. McLaughlin in Casper, Wyoming, we provide proactive estate planning and other legal services for clients throughout the state. If you are in need of a competent business law attorney, we can help. Our law firm has skillfully represented clients for more than 30 years, helping them protect their wealth and assets. Many of our clients are people who want to exert some control over their property and assets even after the property has passed to their heirs, but navigating the legal system to that end can be a complex process. Whether you are facing decisions about estate planning, trying to protect your assets or dealing with a related area of business law, our law firm provides the knowledgeable guidance you need. We will help make sure that you can pass your wealth on to whom you want, when you want and how you want. When you visit our law firm, we take the time to listen to your goals and needs. We value your family stories They help us understand the values that you want to pass on and the legacy that you want to leave. 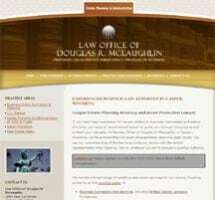 At the Law Office of Douglas R. McLaughlin, we offer free initial consultations. We can also provide home or hospital visits for those who cannot travel to us. If you are looking to start a business, it is extremely important to do things right the first time. The business entity you choose to form has the potential to affect every aspect of your business operations. At the Law Office of Douglas R. McLaughlin in Casper, Wyoming, we work with business owners to choose an entity that will put their business on the path to success and protect them from personal liability. Estate planning is something everyone needs to think about. It is in your best interests and that of your loved ones to have an effective plan in place for administering your assets. Asset protection is an important part of operating a business. Not only do you need to protect business assets from creditors and judgments, but you also need to protect your own, should your business fail or be sued. At the Law Office of Douglas R. McLaughlin in Casper, Wyoming, we provide clients with experienced representation in real estate matters. We represent both buyers and sellers of residential and commercial property.